Kibbeh Bil Saniyyeh means ‘kibbeh in a tray’ and is one of the easiest kibbeh dishes to make, yet full of kibbeh's delicious nutty flavour. In the Middle East, it is served as a main meal with lentil soup or it’s eaten with Arabic flatbread and a salad, the kibbeh pie then being garnished with lots of lemon juice. 1. To make the filling: Heat the oil in a frying pan over low heat and add the meat. Cook, stirring constantly to break up the grains of meat. When the meat is browned and separated and the moisture is starting to evaporate, stir in the onion, spices, salt and pepper and keep cooking until the onion is soft. 2. Meanwhile, melt the butter in a small frying pan and add the pine nuts. Fry until they start to brown, then stir into the meat mixture. Remove from the heat and set aside to cool. 3. To make the kibbeh: Combine the burghul, Habra, onion, baharat, salt and pepper in a bowl and mix well by hand until it forms a paste. You may need a little water to keep the mixture soft. Cover and leave to rest for 30 minutes. 4. Preheat the oven to 180°C and oil a round baking tray with deep sides (around 2 cm). Dampen your hands and layer the tray with half of the kibbeh by forming small balls of the mixture then flattening them over the tray. Smooth the surface and make sure there are no gaps. Spread the cooled meat filling on top, pressing it down a little to keep the layers tight. 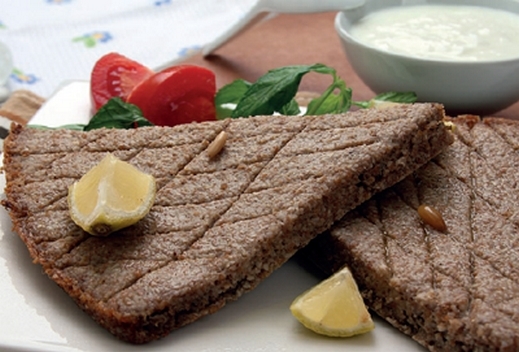 Top with the rest of the kibbeh using the same technique. When the surface is smooth, push a small hole through the centre of the kibbeh with your finger. Slice into wedges fanning around the hole. Brush with the olive oil and bake in the oven for 25 minutes.